When I make my mosaics I don’t generally plan them out in advance. I screw in my frame and start arranging shapes until I am, happy with the pattern. Sometimes I fill an entire section with shapes and take it all apart the next day because I see something new, or the original idea doesn’t flow very well. I have tried a number of things to streamline the process and the most productive experiment involved making smaller mosaic fragments that I assembled into larger pieces. In order to maximize limited workshop time, I constructed squares that were approximately 4″x4″ and used the squares to assemble my mosaic. It sped up the process a little and made for much tighter pieces. It also created some very cool,design possibilities. 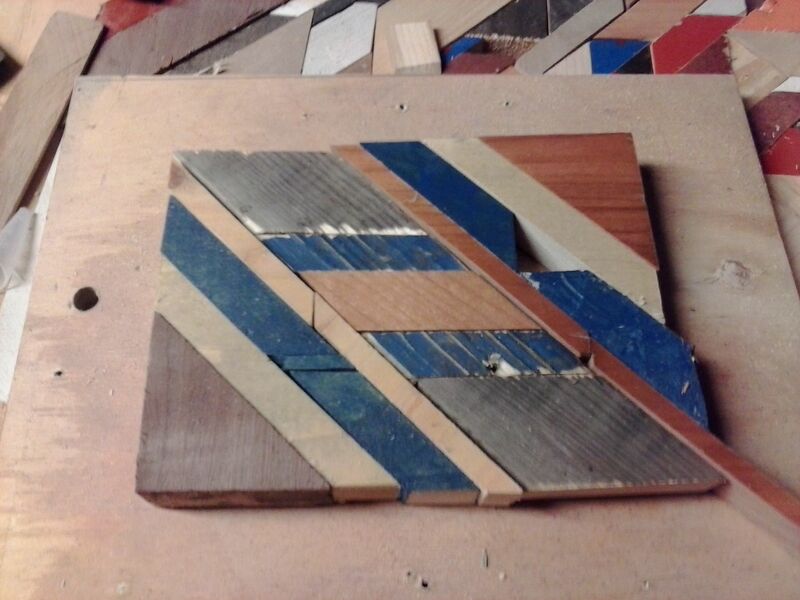 I could take two squares and cut them into 4 triangles and make new squares by swapping out the triangles.It was a great time saver too, sometimes I only have an hour to spend in the shop. In that hour I can’t make a table but I can cut and glue two squares. I do like the bite size approach but lately I have gone old school, making my mosaics one geometric shape at a time. One of the cool things about my pieces is that they are one of a kind,no two mosaics are alike. The uniqueness is usually a positive but sometimes it’s a drawback. What if a customer wanted a pair of nightstands or end tables and a coffee table? Could I replicate a pattern, or at least a similar pattern if I needed to? 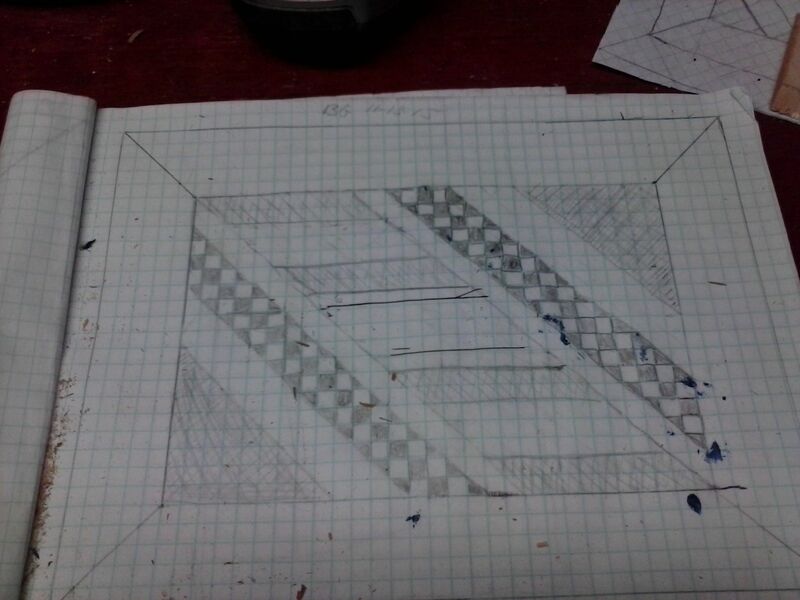 I wasn’t sure, so I took some graph paper blocked out a frame and drew trapezoids, triangles, and parallelograms. 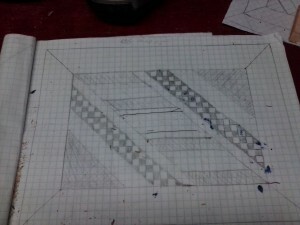 I tried to avoid common patterns, like the herringbone. When I plotted my shapes, I shaded different sections to represent different types of wood. When I finished I laid it out on a piece of wood and cut scrap pieces to fit the design. I made a small one at first to test the process and it is definitely something I will repeat. Since I use reclaimed materials my pieces will still be one of a kind, but I will be able to make sets that are thematically consistent. This is not a technique I will use all the time, but it’s another tool at my disposal. A tool that may come in handy when I am feeling stuck. 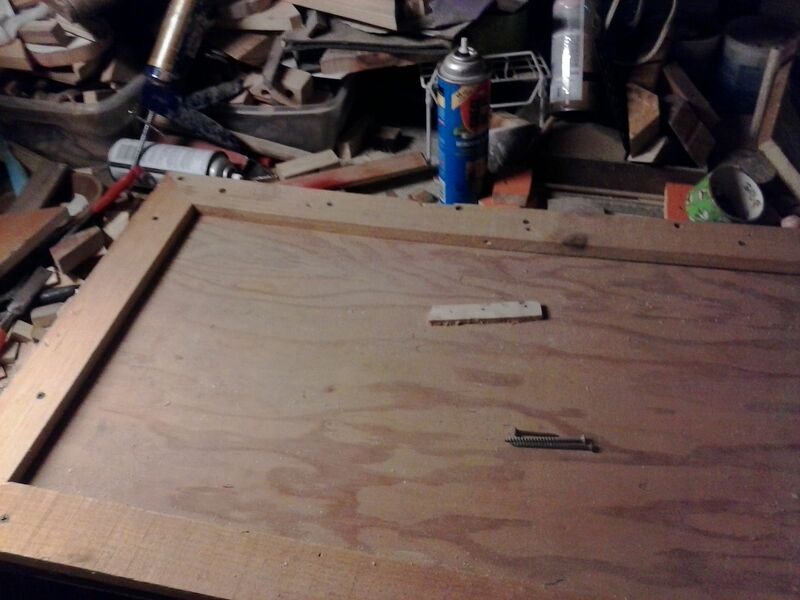 This entry was posted in process, scrap wood, tables, wood working by brighid. Bookmark the permalink.